So – it has been awhile since I have done ANYTHING DIY in our home – we had a few fix immediately situations, and then mostly just sat on the couch and admired my work… ha! But the countertop situation had to be addressed. 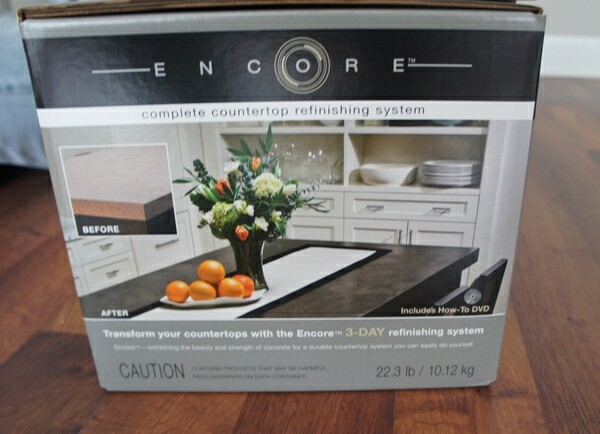 I was so excited to get the chance to review the Encore Countertop Refinishing System – new trendy concrete countertops – YES PLEASE! Post contains affiliate links. When we first moved into our new home (a well loved foreclosure, many of the pieces of the kitchen countertop – front edges, backsplash edges, etc had fallen off and were nowhere to be found) – so I decided I would paint the countertop with countertop paint. Well, I had just come from a rental with granite and was not about to give up putting my hot pans and using it as a cutting board (which I know I am not supposed to do!) – and the countertop paint just didn’t stand up! THEN I found an idea on Pinterest with craft paint and lots of polyurethane coats. This also did not stand up to our wear – although I have kicked the cutting things and no hot pad protection on the countertop habit. At this point, I am still less than a crazy amount of money in on countertop fixes – but I do not want to install new countertops yet because I still have in the back of my mind that we will rip the whole thing out one day. 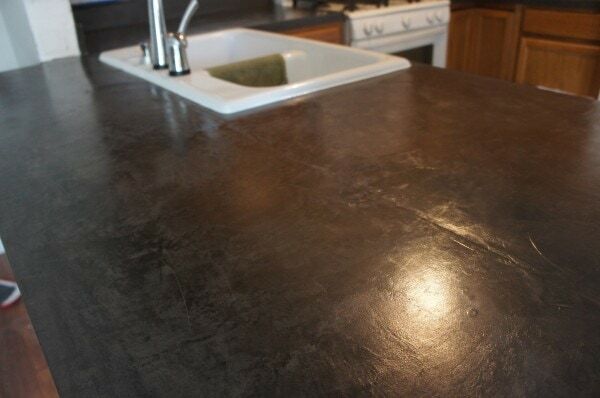 I was so excited to find the Encore solution, it gave me the concrete countertop look I wanted – and for cheaper than newly installed countertops! They have a well-organized three day solution. When you open the box each of the days is in a separate container. 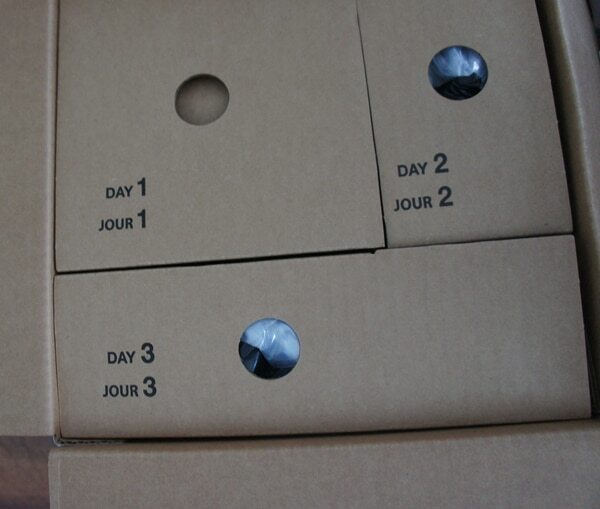 Each bottle, bag, and container is labelled with the day and the step – so unless you cannot read, it should be pretty easy to figure out! Day 1: Base coat bond – this was in a paint can, but it is basically cement and it goes on looking icky – not to worry, you can sand out messy layers and it will all fill in smoothly with the next couple days of materials. 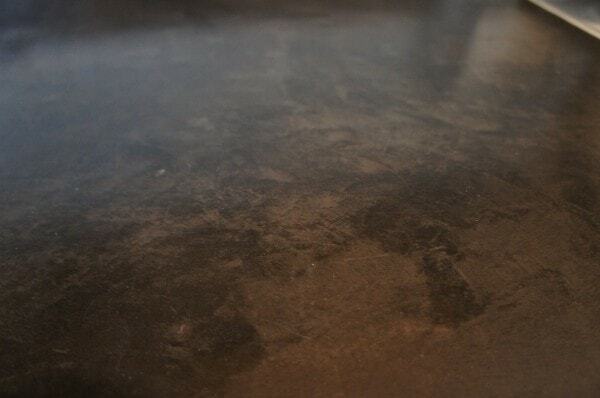 Day 2: This is the day that you REALLY get to see what the countertop will start to look like. The dye is added and the cement you are layering on gets finer and smoother. The last coat (Day 2, Step 3) of the day feels like you are pouring on a liquid, but will smooth out into the cement troweled look. Day 3: You are putting on the sealer coats, which shines up the whole thing. Three days felt kind of LONG, but in the end it looks great! 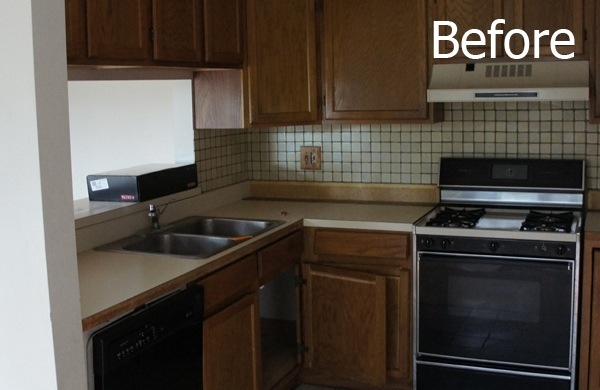 As you can see in the before and after pictures – we have done a lot more than just countertops – but I think they really help modernize the space – now I just need to get to the cabinets. I cannot decide if I want to go all white or darker wood on those, so our finishing the kitchen has been delayed. Note: we did take off the “bar” and remount it lower so it made a larger piece of counter – we used the Encore to help us unify the look of the two pieces. Overall – I like how it turned out and would recommend it if you think it is something you want to take on (some people might be intimidated, but if you are on the fence, just go ahead and try it!) You can check out the WHOLE project at my blog delightfullycreative. 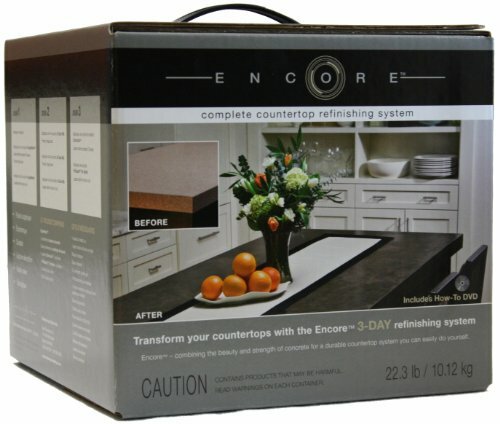 You can purchase your own Encore Countertop Refinishing System at Amazon. They offer it in 5 colors (mine is the Sterling Grey). 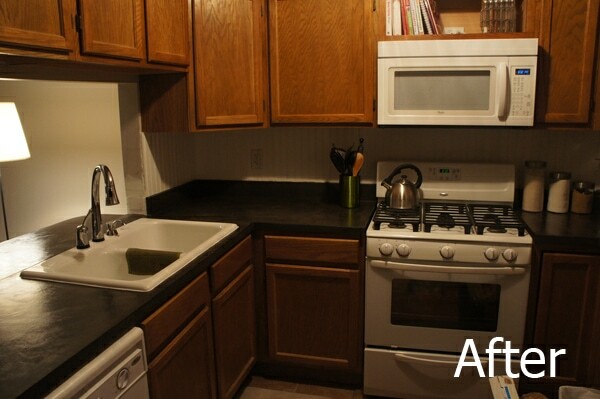 I think those cabinets look great with all the changes you made!